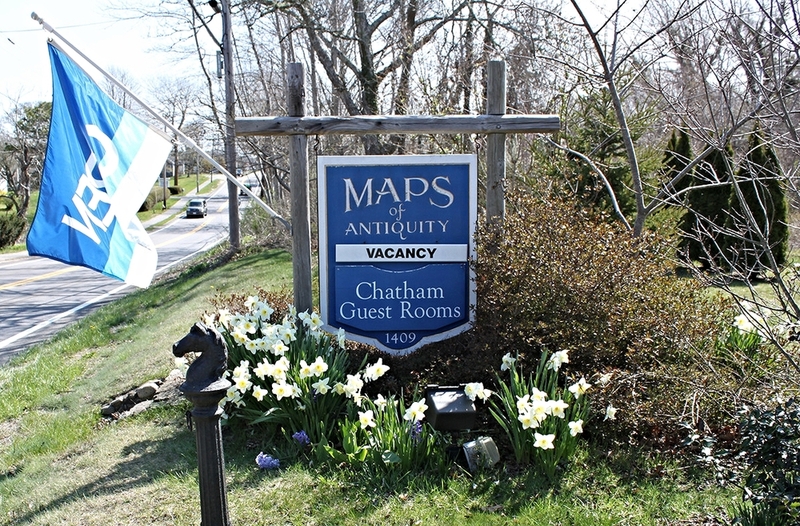 Centrally located halfway between the Cape Cod Canal and Provincetown, Chatham Guest Rooms offers a distinctive and comfortable place to stay in Chatham. The Chatham Lighthouse and both Atlantic and Nantucket Sound beaches are all less than 2 miles away. We are only 1.5 miles west of the historic village center of Chatham, which offers gift shops, restaurants, art galleries, and unique year-round entertainment. Our historic farmhouse, built in the 1700's, won a 2006 Preservation Award from the Chatham Historical Society. The ground floor of the building houses our other business, where we sell antique maps at Maps of Antiquity. Stop in during your stay to see unique maps of your home town, state, or country! Each of our spacious guest rooms has a private bath, a separate entrance, and a view of our ecclectic garden. All of our rooms have been renovated with custom carpentry, combining old world character with modern conveniences. The friendly innkeepers are available daily, and are happy to provide guests with detailed information about our area. We welcome visitors of all ages and nationalities, and can further assist with our ability to speak French. If you will, imagine a place where fishermen and stockbrokers get together to talk about the tides; a place where yoga classes are taught on the beach at sunrise while seals play offshore, and where the wintry weather is wonderfully unpredictable. Join us. We look forward to your visit! Rates range from $95 to $135 for the East Room, $125 to $175 for the Garden Suite, and $135 to $195 for the Main Suite dependent on season and holidays. These rates are based on one or two people sharing one bed- additional beds or people are subject to additional fees.